This might be staled news, but the time is always right to applaud a move in the right direction. 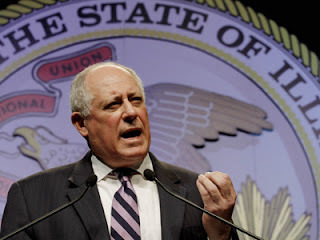 Last week, the State of Illinois, with the signature of Governor Pat Quinn (Patrick Quinn), 41st Governor of Illinois, abolished the death penalty. To this effect, no one in Illinois will be subjected to State-sponsored killing. On 9 March 2011, the governor signed a historic bill - abolishing the death penalty. He also substituted the death sentence of 15 inmates in Illinois with life in prison - without parole or "any chance of release." According to Chicago Tribune, the death penalty had been in place in Illinois since it was reinstated 1977, and the system was tainted by "bias, error and incompetence." Personally, I oppose the death penalty because I believe it is an immoral and degrading form of punishment. It undermines the principle of human dignity which states have the moral and legal obligation to uphold. States ought to punish; not commit murder. Besides, given the high rate of wrongful or discriminatory convictions in many states, including Illinois, Texas, and other states and countries around the world, the risk of claiming an innocent life is real. I welcome the abolition of the death penalty in Illinois under the leadership of Governor Pat Quinn, and commend the governor - and lawmakers who support the ban - for restoring human dignity and respect for human life in Illinois. The death penalty violates respect for human life. By practicing it, a state shoots itself in the foot. Amnesty International notes that Illinois is the 16th state in the U.S. to abolish the death penalty. Watch a video statement from Governor Pat Quinn on the abolition of the death penalty in Illinois. Well said, Zuzeeko! "Personally, I oppose the death penalty because I believe it is an immoral and degrading form of punishment. It undermines the principle of human dignity which states have the moral and legal obligation to uphold. States ought to punish; not commit murder." Enrique, I'm glad you agree.